Both units fly variants of the Chinook heavy-lift helicopter in support of special operations forces. The 160th SOAR, or the 'Night Stalkers', also operate MH-60M Black Hawk and MH/AH-6M Little Bird helicopters. In June 2015, around 60 RAF personnel and 2 Chinook Mk6 helicopters travelled to Joint Base Lewis-McChord, Washington, in the United States for a 3-week training program with the 160th SOAR. The training included exchange flights during which men from each unit could experience the equipment and procedures unique to their counterparts. The RAF Chinook Mk 6. The Mk6 (or HC6) features a digital glass cockpit and a Digital Advanced Flight Control System (DAFCS). A turret under the nose holds a Selex ES Titan 385ES FLIR/EO pod which enhances the pilot's ability to fly in low light conditions. A Selex ES Helicopter Integrated Defensive Aids System protects against anti-aircraft missiles. "I'm blown away by how light their aircraft are. We are used to flying a heavier aircraft and their tactics are revolved around flying a lighter aircraft. They come in a lot faster than we do. The advantage on board the U.S. Chinook MH-47G aircraft is primarily technology, where as the Mark 6 is in its weight. The mindset of both aviation units is identical, providing support to the forces on the ground." The difference in performance and handling is not surprising. Both variants use the same model of engines: 2x T55-GA-714A engines, but while both aircraft are based around the CH-47F airframe, the MH-47G sports a set of 'fat' fuel tanks fitted along each side of the fuselage. These greatly extend its range but also result in a heavier and slower aircraft. Air-to-air refueling (AAR) capability. The U.S. MH-47G can be fitted with an extendable refuelling probe which enables the helicopter to take on fuel in-flight during a mission, thereby greatly extending its operational range. No UK helicopters have this capability. Note: a small number of HC2 aircraft were upgraded to HC2a (now HC4a), which included strengthening the forward fuselage so that a refueling probe could be fitted in the future but, as far as is publicly known, this capability was never utilised. Terrain-following / terrain-avoiding (TF/TA) radar. The MH-47 sports a multi-mode radar in the form of the AN/APQ-174A MMR (soon to be replaced with the AN/APQ-187 Silent Knight). This piece of kit greatly enhances the aircrew's ability to operate the aircraft at low level in adverse weather and low / zero visibility conditions. Essentially this means that 160th SOAR Chinooks can fly in conditions that would ground 7 Squadron. "...carried a Special Forces A-team from a forward support base in Uzbekistan to a rendezvous with anti-Taliban forces in Afghanistan. The Chinook crew used multi-mode radar to find a way through mountains in zero visibility, refueled at low altitude from an Air Force MC-130P tanker..."
It goes on to describe how the helicopter "...penetrated a dust storm before climbing over mountains into solid cloud. From 16,500 feet, the Chinook crew again used terrain following radar to let down into the target area and deliver the special operators. On the return, they descended from altitudes near 20,000 feet in zero visibility, refueled once more from an MC-130, and again used radar to negotiate the mountains. Overall, the mission lasted 8.3 hours, including 6.3 hours in adverse weather over hostile territory." A U.S. MH-47 Chinook. Note the extendable refueling probe visible on helicopter's starboard side. On the port side can be seen the black radome of the terrain-following radar. The aircraft's 'fat' fuel tanks can also be easily identified. The nose houses a weather radar, a device absent in the UK Chinook fleet. 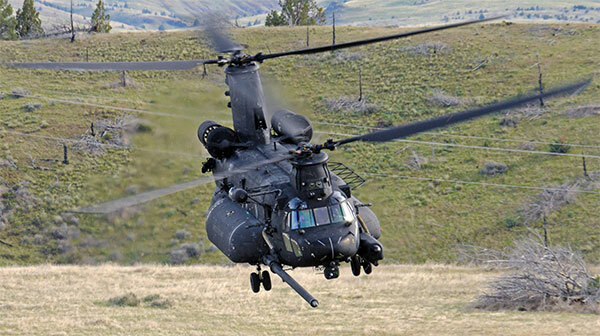 Like the UK Chinooks, the MH-47G carries a suite of defensive countermeasure systems. These include decoy launchers, jammers and infrared suppression systems on the exhaust. It was with the need to rectify some of these shortcomings that, some time ago, the MoD set about procuring a dedicated special operations Chinook. The HC3 project, started in the late 1990s, intended to develop a Chinook for 7 Squadron that would, in essence be a slightly less advanced MH-47E. It would not have a terrain-following radar but it would feature enlarged external fuel tanks, a refueling probe and a weather radar. To aid in night flying, the HC3 was to feature a night vision goggles-compatible cockpit and a forward-looking infrared (FLIR) sensor. A series of problems with the procurement resulted in an aircraft that had to be downgraded for use on regular operations. It lost the refueling capability and the Bendix weather radar housed in the nose. The only feature left on the helicopter that enhances its use in the special operations role is the set of plus-sized fuel tanks. The HC3 fleet is undergoing avionics upgrades to HC5 standard in order to bring it in-line with HC4 and HC6 models. A RAF Chinook HC3. The HC3 / HC5's nose is slightly larger due to it once holding a weather radar. Note the larger fuel sponsons, comparable to the ones found on the MH-47G. With tanks at double the size (7,830 litres) of the HC4 or HC6, the HC3 has the longest unrefueled range in the British Chinook fleet. When discussing the AAR issue, it should be remembered that the helicopter is only one side of the equation. A compatible airborne tanker is also required. The U.S. Air Force operates several special operations squadrons that fly tankers based on the C-130 airframe. These tankers, such as the MC-130J Commando II, are capable of the low and slow flight profiles needed to refuel rotary wing aircraft. Coupled with the refuelling probes found on helicopters such as the MH-47 Chinook, these tanker fleets enable the U.S. to carry out special operations at a range that is literally out of the UK's reach. *update: a January 2016 report indicates that the UK is in the early stages of looking into the helicopter AAR issue. 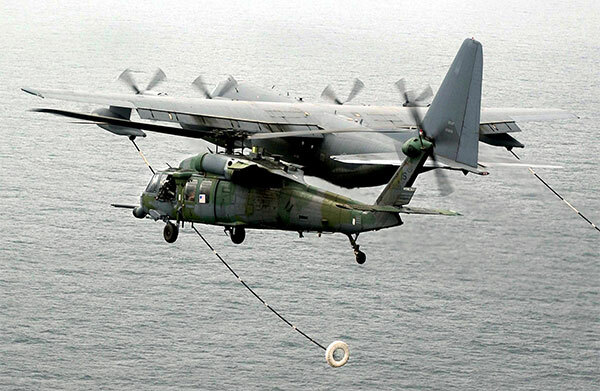 A HH-60G Pavehawk helicopter prepares to be refueled by a MC-130P Combat Shadow. Even if UK helicopters were fitted with refueling probes, they would have to be refueled by allies with compatible tankers. A UK-only long range special operation involving helicopters that requires in-flight refueling is therefore, for the time being at least, a pipe dream.